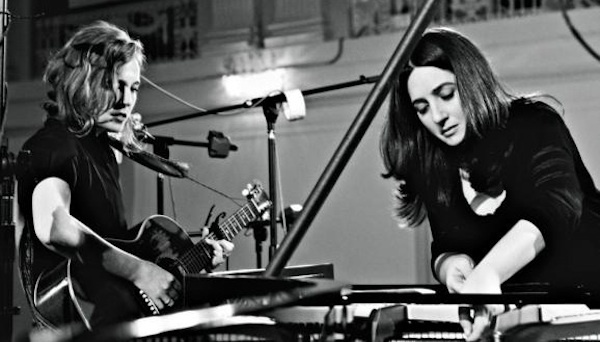 Pianist Simone Dinnerstein and singer-songwriter Tift Merritt join forces for the first time on NIGHT, a unique collaboration uniting folk, rock and classical worlds, exploring common terrain and uncovering new musical landscapes. Available on April 15 2013 from Sony Classical, Night was recorded at the Academy of Arts and Letters in New York by Grammy-winning producers Adam Abeshouse and Ryan Freeland. Dinnerstein and Merritt will launch the new recording by performing Night live in cities including Munich, New York, Durham, Tampa, and Saratoga in Spring 2013. The New Yorker has called Tift Merritt “the bearer of a proud tradition of distaff country soul that reaches back to artists like Dusty Springfield and Bobbie Gentry,” a standard upholding that got underway in earnest with Bramble Rose, the 2002 solo debut that put her on the Americana map forever. As her sophomore album, Tambourine, was followed by Another Country and See You on the Moon, Merritt found acclaim coming not just from critics and awards organizations but her own heroes, like Emmylou Harris, who marveled that Merritt “stood out like a diamond in a coal patch.” Now a leading lady in her own right, Merritt is hardly one to hog the spotlight. She engages in dialogue with fellow artists of all disciplines on her public radio broadcast and podcast “The Spark With Tift Merritt,” bringing in fellow sojourners ranging from Patty Griffin and Rosanne Cash to Rick Moody and Nick Hornby (who devoted a chapter to Merritt in his 31 Songs book). Of her latest album, Traveling Alone, released by Yep Roc in October 2012, USA Today raves, “Steel-laced country-soul only hints at the sublime charms of Merritt’s Traveling Alone,” and Paste writes, “Traveling Alone... not only shows her true lyrical and vocal range, but suggests an adventurous spirit beneath the placid surface.” View official website here. American pianist Simone Dinnerstein is a searching and inventive artist motivated by a desire to find the musical core of every work she approaches. The Independent praises the “majestic originality of her vision” and NPR reports, “She compels the listener to follow her in a journey of discovery filled with unscheduled detours.” The New York-based pianist gained an international following because of the remarkable success of her recording of Bach's Goldberg Variations, which she raised the funds to record. Released in 2007, it ranked No. 1 on the U.S. Billboard Classical Chart in its first week of sales and was named to many “Best of” lists including those of The New York Times, The Los Angeles Times, and The New Yorker. The three albums she has released since then – The Berlin Concert, Bach: A Strange Beauty, and Something Almost Being Said – have also topped the classical charts, with Bach: A Strange Beauty making the Billboard Top 200, which compiles the entire music industry's sales of albums in all genres. Dinnerstein was the bestselling instrumentalist of 2011 on the U.S. Billboard Classical Chart. Her performance schedule has taken her around the world since her triumphant New York recital debut at Carnegie Hall's Weill Recital Hall in 2005, to major venues including the Kennedy Center, Vienna Konzerthaus, Berlin Philharmonie, Lincoln Center, and London's Wigmore Hall, among many others. She has been a soloist with leading orchestras including the New York Philharmonic, Tokyo Symphony, Vienna Symphony, and more. Dinnerstein has also played concerts throughout the country for the Piatigorsky Foundation, an organization dedicated to bringing classical music to non-traditional venues, and performed at the Maryland Correctional Institution for Women in a concert organized by the Baltimore Symphony Orchestra to coincide with her BSO debut. Dedicated to her community, in 2009 Dinnerstein founded "Neighborhood Classics", a concert series that raises funds for and is hosted by New York City public schools. View official website here. Watch an excerpt of NIGHT from WNYC, New York Public Radio.